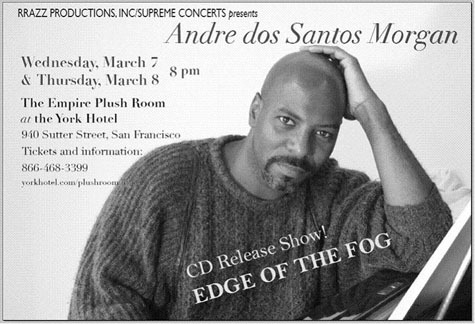 Singer/Keyboardist/Songwriter/Entertainer André dos Santos Morgan will be performing at the Empire Plush Room in SF on March 7 and 8 at 8pm each night. These shows also celebrate the release of his new CD, Edge of the Fog. For more information, contact the Empire Plush Room Box Office or andredossantosmorgan.com. This entry was posted on Wednesday, February 28th, 2007 at 6:55 am. It is filed under Music News/Info. You can follow any responses to this entry through the RSS 2.0 feed.